Specialised in urban and regional planning, sustainable urban development, interdisciplinary landscape research, evaluations, green growth and innovation. Kjell is a member of the Editorial Board of the European Journal of Spatial Development, European Structural and Investment Funds Journal, and Urban Forestry & Urban Greening. 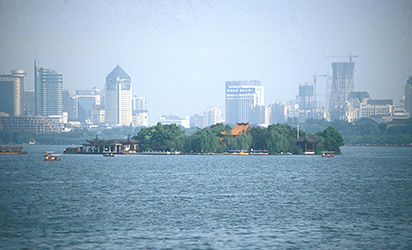 Hangzhou is the capital of the Zhejiang Province in Eastern China. It was already a densely populated city by the 13th century, with over a million inhabitants, 12 000 stone bridges, 3 000 public baths and ten large market places with an abundance of meat, fish, vegetables, spices, art and pearls. An enthusiastic Marco Polo recounted all of this and more, following his visit to the ‘heavenly city’ around 1280. The inhabitants’ favourite pastime was a boat ride on Xi Hu (West Lake), from which you could enjoy the city in its full glory with its countless palaces, temples and monasteries, whose gardens stretch down to the waterfront. Xi Hu is still a major attraction, both for the city’s own inhabitants and for the many tourists that visit Hangzhou each year. It was originally a lagoon at the mouth of the Qiantang River, surrounded by banks of sandy sediment that over the years had merged together to create a shallow lake, flooding during heavy rains and drying out during extended dry periods. At the end of the 8th century, around the middle of the Tang Dynasty, poet Bai Juyi became Governor of Hangzhou. He noticed that agriculture around the city was suffering from these dry periods, and therefore ordered the construction of larger and stronger banks around the lake, so that the water level could be regulated and the water used to irrigate the surrounding lands. Just over 300 years later, during the Song Dynasty, another famous poet, Su Shi, was appointed Governor of Hangzhou. Once again, the farmers were suffering during droughts due to the lake having become overgrown and the irrigation channels had become clogged up. Extensive renovation work began and the lake bed and channels were cleared. The dredged sediments were deposited into a 2,6 km long causeway that crosses the lake and which to this day still makes it possible to experience the same scenery from dry land as you can from the boats. One of the attractions along the causeway is called ‘Spring Dawn at Su Causeway ‘, one of ten scenic spots with poetic names around Xi Hu. Today Hangzhou has a population of 7 million. A recurring theme with most architects and planners reporting about the new area in China is that they are impressed by the ambitions to meet the need for green areas for the new inhabitants. I see two reasons why China is prioritising city greenery and outdoor environments so highly. The first has to do with legacy and tradition – as we know, Chinese landscape gardening is among the finest in the world. The second reason for greenery’s central role in Chinese urban development has to do with political priorities. When the dean of the faculty for architecture and landscape architecture at Peking University, Professor Kongjian Yu, was asked by a journal to select a text that was particularly important for spatial development in modern time, he chose President Hu Jintao’s report to the 17th National Congress of the Communist Party of China in October 2007. It was the first time a leading representative of the Chinese political system – and not just anyone, the President and General Secretary of the Communist Party himself – had spoken about the development of an ‘ecological civilisation’. Not only was it a completely new expression for the Chinese language, it also reflected a new way for the political leaders to define the development. Instead of focusing solely on economic growth, as they had done up until now, in a land where 75% of all lakes and waterways are polluted and 2/3 of the cities suffer from water shortages and severe air pollution, they had finally realised that long-term sustainable development presupposes a sensible relationship with nature.